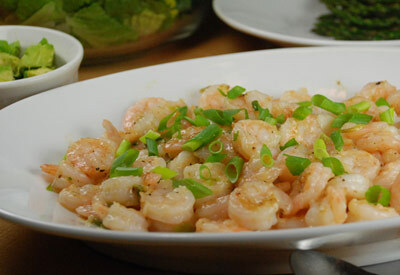 Soak shrimp in lightly salted water (1 to 2 tsp sea salt) for 5 minutes. Drain, rinse in cool water and pat dry with paper towels. Sprinkle cornstarch over shrimp and gently toss to coat. In a small bowl, stir together ground pepper and salt and set aside. Heat 1 tbsp olive oil in a wok or large saute pan on medium high heat. Add shrimp and stir fry until shrimp turn pink. Remove shrimp from pan and keep warm. Wipe pan clean. Add remaining 1 tbsp of oil and stir fry garlic, serrano pepper, white portion of onion, salt and pepper for 1 minute or until tender and aromatic. Add shrimp back into pan and stir fry until coated with mixture and shrimp is tender. Garnish with remaining green onion and serve plain or over rice.